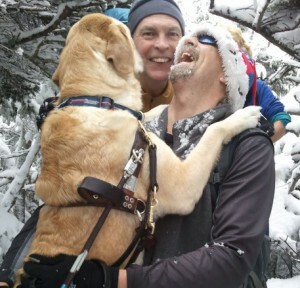 Tags: Autumn, blind hiker, Hike Leader, Hiking, Inspiration, outdoors, Randy, success. 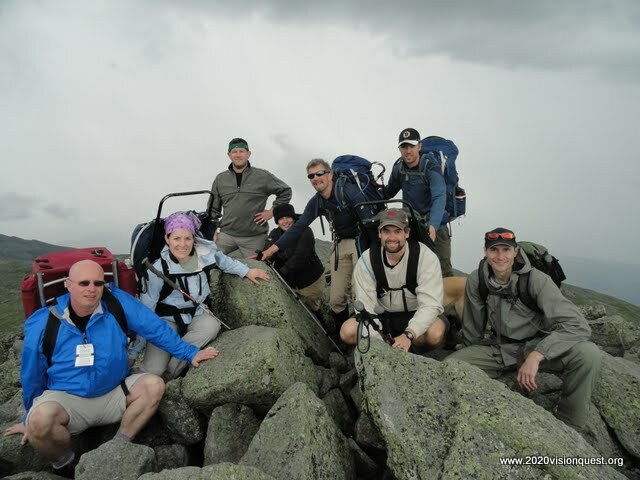 I joined the students of this leadership and backpacking course in the spring of 2010 in preparation for my own hiking adventures and to provide an untypical aspect for those students. Those experiences and friendships left a significant imprint upon me and I continued to be involved in different ways through the years since then. This year Brent asked me to act as the TA for the class and we went through the appropriate approvals, hoping my many experiences in hiking, leadership, and communication would provide positive guidance in the classroom and along the trails. Day 1: We set out on May 21 with my legs being a little weary from the Gate City Marathon the day before and my pack a little heavy as I was carrying Autumn’s sleeping bag and food along with all of my own supplies. The two student leaders of the day, Brian and Sam had provided us walkie-talkies to keep communications open in our two vehicles as we approached the trailhead for our first day’s hike into Wachipauka Pond. As usual Autumn spent the first 100 yards being a little too enthusiastic and I had to mitigate her enthusiasm with my own enhanced caution as my right hand trekking pole work was emphasized. Quickly she settled into high quality trail work and I was very proud as on the hot day and steady climb she simply shined in work and obvious love for the wilderness. I spent the early part near the back with Brian behind me as sweeper, ensuring the group was together and ahead of him. As we began our first descent we switched to a little trail entertainment by partnering up, me with Caitlin, to talk about our day and trip goals with each other. It was a chance to begin building better connections and worked rather nicely. Ultimately as we reached a series of “bog bridges.” Autumn and I worked them tediously but Caitlin had the opportunity to help by becoming the first student to choose a little human guiding. She set the tone for many others later and we worked the short stretch of trail building the guide language for a comfortable pace and quality interaction. In short order, our shortest day brought us to Wachipauka Pond. The temperatures were ideal, the scene as majestic as previous trips promised, and for a time we just relaxed and enjoyed the remote serenity earned by an afternoon of trail work together. My SteriPEN water purifier refused to light as the single downside of my evening preparations, but Brent and the team found ways to help Autumn and me have purified water for the trip. 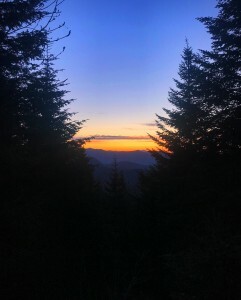 The leaders brought the team together and bear bags were hung, tarps for sleeping and cooking were established and an idyllic evening descended complete with one of the sunset gifts those who experience them in the White Mountains usually treasure for the rest of their days. We had a couple of meetings to close out our activity before sleeping open to the air with the sounds of the pond and the likely moose who traipsed belligerently within 50 yards of our campsite and left his marks for us to find in the morning. Day 2: Samm and Anthony were our leaders. (This “Samm” was male, vs. the female “Sam” who led on day 1.) Anthony was taking a bonus leadership day to fill in for our first casualty as Chloe had an illness requiring her to miss the trip. We started out with a steady upward climb to the Webster Slide summit and a beautiful overlook, our first official “peak” of the trip. We did a little stretching as a group and had a lot more interactions amongst the team as both Bridget and Emma took some turns guiding me to supplement the great work being done by Autumn as well. Down is simply always easier with a human guide and there were some fun challenge points along this route. We made excellent time to cross a road and make a significant water crossing which included an educational moment for the various methods of safer water crossing. Autumn showcased multiple crossings until a stick enticement convinced her to go all the way over and be held there awaiting my cross. There is a point in most hikes where conversations bring teams together and as the rain held off for us, the trail was generally gentle, we came together decently. Just to enhance the scenario of challenge, a “fake” broken arm practice was added to the leader challenge and still we arrived to the Jeffers Brook Shelter ahead of schedule and feeling strong despite the rain joining our group. Several of us made use of the shelter and had a few AT through and section hikers to enhance the evening conversations. The evening debrief was a supportive and encouraging preparation for what most expected to be our most challenging day. Day 3: Bridget and Anthony had us up at 5 with light traces of the rain still falling. Brent was ill and that complicated the start, as did our plan to hike a short distance to a car spot where we would have breakfast and adjust some equipment for the remaining trip. This was more important, as Brent’s medical device had lost its charge and the back-up battery wasn’t working. As my water purification system had seemingly failed, Brent was my support and my cook partner so both of us became a delay for the group. At the car Brent charged his device, we repacked, and set out for the Glencliff trail and Mt. 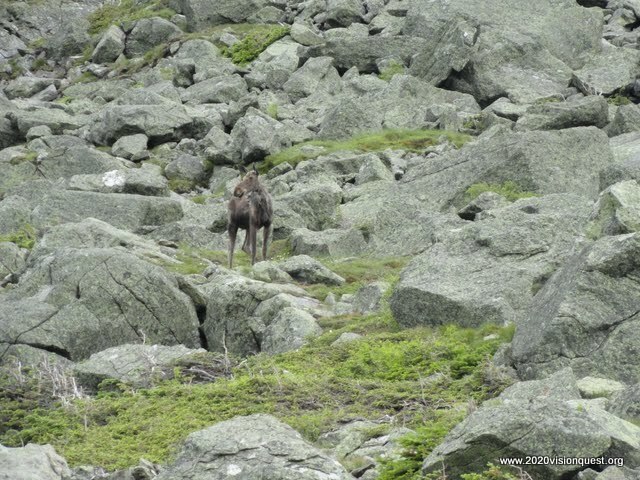 Moosilauke! Because of the low water aspects, I had my heaviest water load, and below Glencliff the trail gets a little boulder-strewn. Due to this, after the steady steepness we reached a section of trail which was particularly hard work for Autumn and me. At this point I shared my struggle to keep the group pace and for a short time switched to Emma guiding me to bolster both of us for a bit. 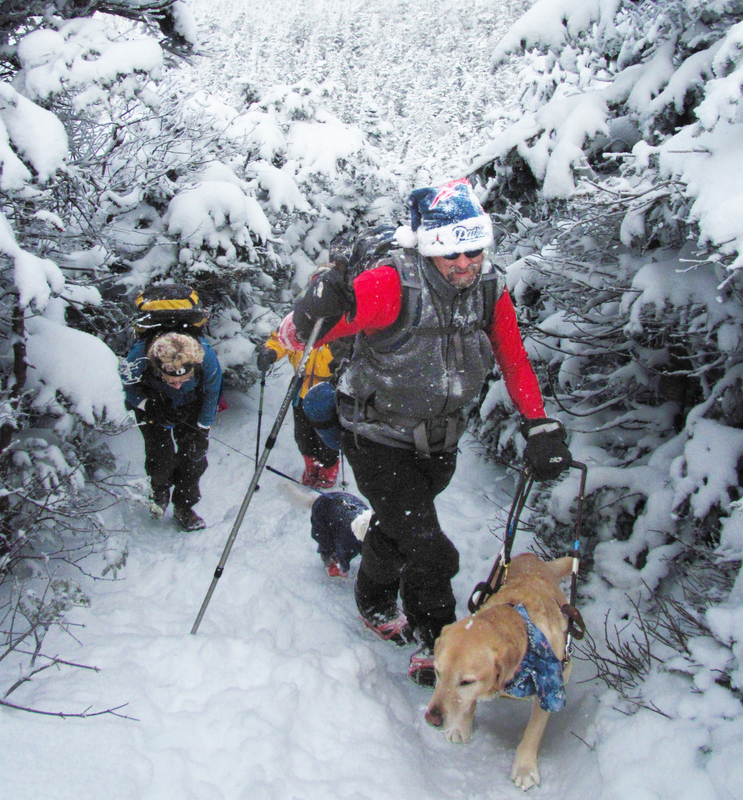 Then Samm took his first shift to handle the long steady steep up to and over the headwall of Moosilauke with us pushing well into the full hunger-almost-hangry range for the team. A well earned lunch below south peak recharged us for the glorious ridge walk which Autumn handled once again until we emerged in the boulder fields and alpine zone where Brent guided as we all managed an impressive 40 mph wind for our spectacular summit reward! Our goal for the day was Beaver Brook Shelter and so a fair bit of hiking remained. 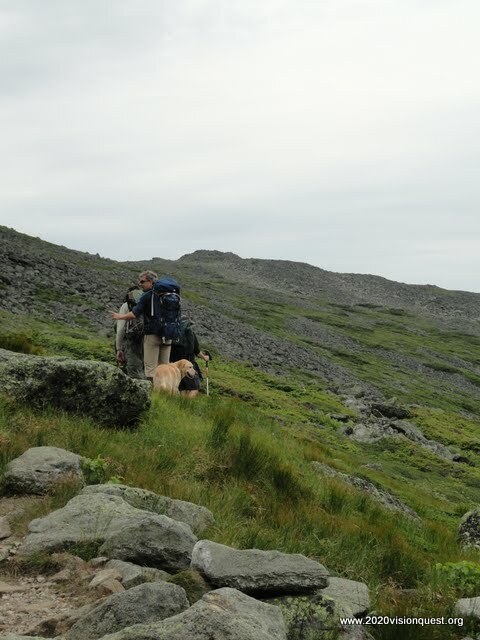 The trail involved some particularly precarious sections and due to Brent’s overall health concerns, he needed to be free of guiding. The students realized Autumn and I would be slow on this track and so took the challenging load for a strenuous section concluding with a considerable amount of snow/monorail hiking led by Sam, working some impressive final descents to the much celebrated shelter. It was a very weary team debrief, proud of the accomplishments and having fully come together to work through all the challenges and fully understand the many ways of supporting each other. Our AT section hiker had made the journey with us and surprised some by sharing that in his 23 years of section hiking the Appalachian Trail, this was his hardest day ever. Day 4: Our fourth and final day began with the most powerful sunrise of the trip. We faced out over the Kinsmans, the Lafayette ridge, and the presidentials beyond with the sun rising to give the layered mountains a particularly majestic splendor few will ever forget. Caitlin and Emma were our leaders of the day. Brent had experienced his roughest night and was resolutely tending himself to overcome a difficult start. It was crisp and cold at our 3800 feet of elevation and Autumn wisely chose to curl up with our AT companion as he was the last one in a sleeping bag once we had all packed and prepared for departure. We set out as quickly as possible to retrace some of our prior evening’s steps up before descending steadily down through an old forest. It was part of a long-ago Dartmouth ski trail from an era when skiing involved no turns other than what the trail made! Some of the terrain was more difficult than anticipated and trail games had the group laughing and entertained while I was in full concentration. On a particularly rough trail, I rolled an ankle on a shifting rock more seriously than usual, which resulted in a rare fall for me. The mirth of the group would be essential as would Brent’s high focus guidance to ease my hobbling worked out the long miles still remaining. 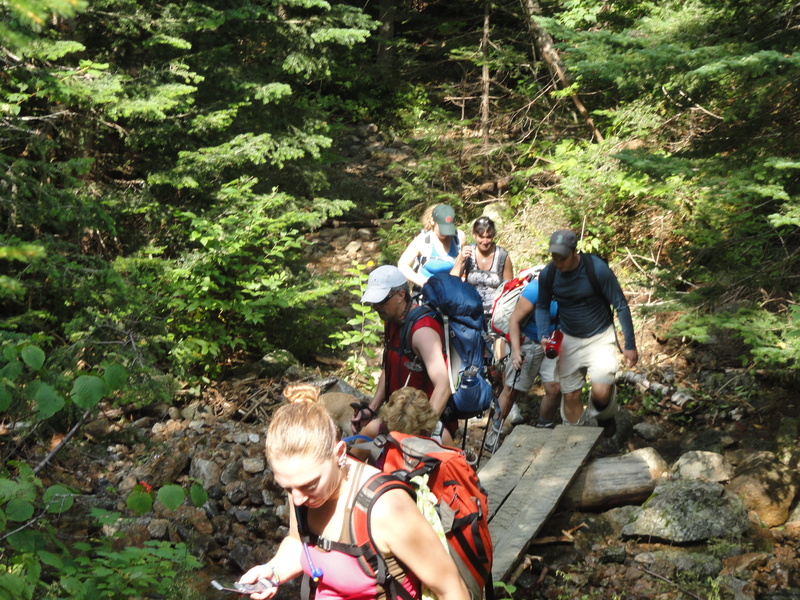 When the trail eased by our stream crossing and gentle footing allowed us to pick up pace and find the Ravine Lodge for reward, a weary but satisfied group had once again undergone the transformative process of such hikes. 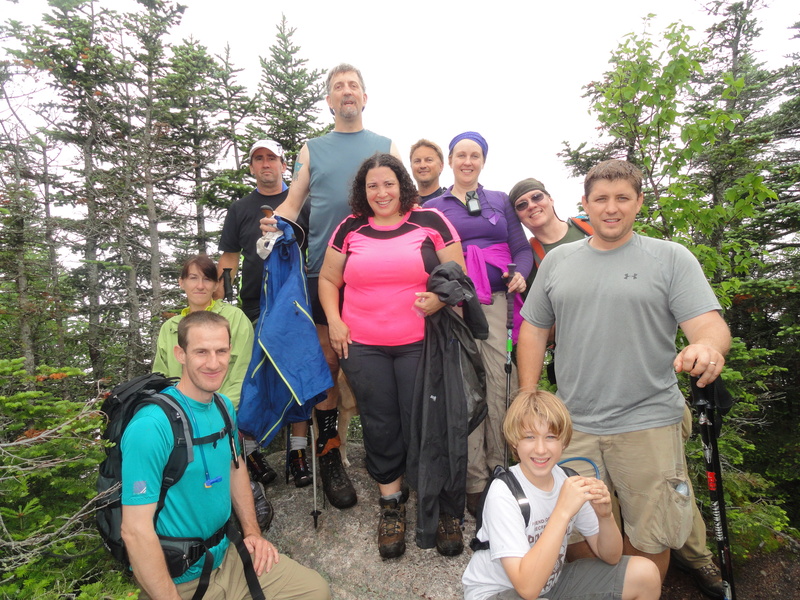 Leadership, guidance, and the richly rewarding wilderness experience were certainly all part of the process. For Autumn and me, we had bonded well with the people of this trip and it was easy at times to forget the decades of difference in our ages because of the commonality of our experience. There is a sadness to the ending and knowing we will never have the same group together to experience all of the varied powerful moments we did share. There is, however, much reward in knowing we grew together, shared together and all of us, student, teacher, and Autumn extraordinaire experienced individual growth on our journey towards personal peaks. I’ll take the growth and the memories and the solace of knowing the choice to be on the path is the most rewarding one of all. Tags: 2020VQ, blind hiker, Carrigain, Hike Leader, Hiking, Inspiration, outdoors, Randy, success. There are many reasons why I and many others choose to climb mountains. Spectacular panoramas are a common reason and Mt. Carrigain provided this magnificently on our next to last hike of the original 2020 Vision Quest. Once nicknamed the “Great Watch Tower of the Wilderness,” it is positioned perfectly to reveal the unfurled horizon’s general splendor as well as the vast majority of the peaks in our quest. All too frequently on these mountains, foreground mountains hide further peaks. But here, the angles play to the favor of Carrigain’s location and all but 4 of the 48 are exposed. 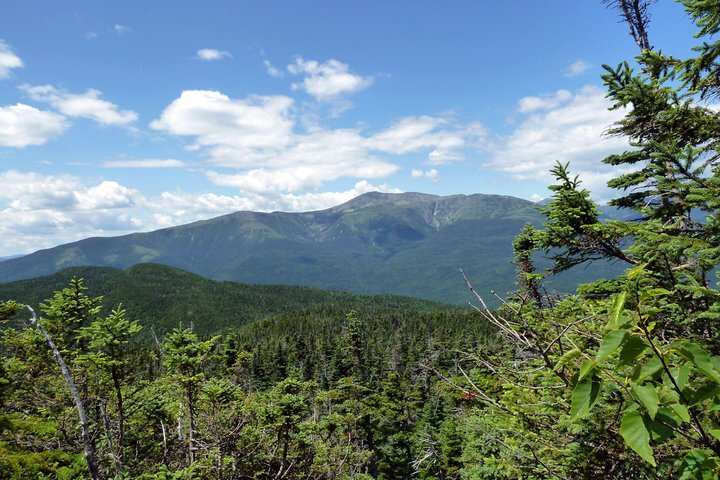 The views along Signal Ridge and atop the platform of the summit are as majestic as any to be found in the White Mountains of NH and yet those are such a small bit of the worthiness of the experience I find in the journey. It is all too easy to focus upon accolades over achievement as Mr. McCullough gave us in the same speech as his quote above. The mountain vistas are one of the many rewards and the summit an accolade of sorts as well. The reasons we have for arriving at a trail-head in the early morning hours, the motivation behind the many miles of wilderness-walking and the perseverance through myriad moments of doubt or hesitation at challenging moments along the path are for more significant parts of the experience for me. The views we may glimpse inside ourselves are likely more poignant to our lives. Hopefully there is little surprise in observing also that the inspiration of our companions on the literal and figurative path of the peaks may inspire beyond even the wonders of nature which for me are the garnish on the plate of offerings the experience delivers. Our Carrigain crew as always begins with the Mighty Quinn. 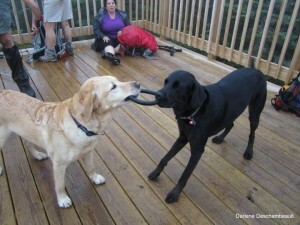 It also included Frisco, a pup on his final week in NH before heading to Quinn’s Guide School to perhaps become the future freedom for a blind person. Two older friends also joined us, a bit removed from their hiking days but returning as part of their support from our annual auction. This couple brought their two very young daughters and a young dog on a newly reconstructed knee! All three of them on their longest journey of this magnitude ever. Newer (kite wielding!) 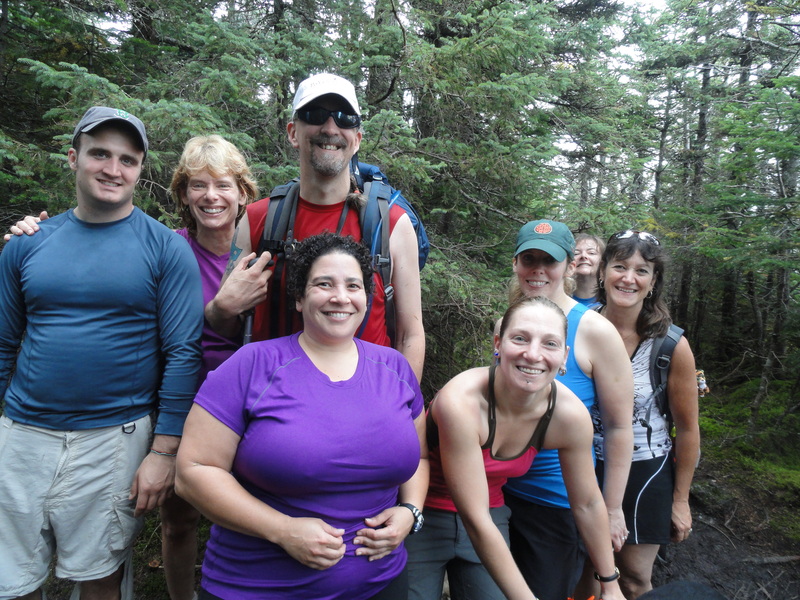 friends who have made many miles possible in life and on trails joined us once again to lend experience and laughter. Another fine couple carved out a day as they have done annually since our hiking began despite the busy lives surrounding them. 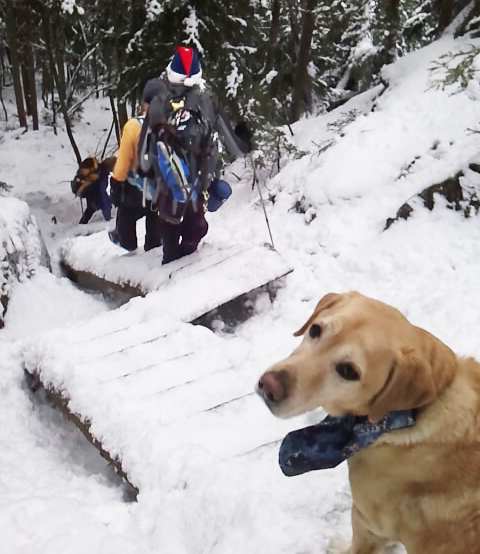 A winter hiking partner and her no-longer-too-young-to-hike pup also came, as well as four of us who have made nearly every hike of this season together. The final piece was our leader, a very close friend, flown in from Seattle to join us for the only time in our many hikes as distance keeps the physical presence far less frequent than the many methods of support for our efforts and experiences on and off these mountains. A diverse and different crew we were, all gathering and seeking something likely a little bit different from the opportunity. Still more hikers would be met along the way, some finishing their 48 for the first time, some who run them regularly. There were some for whom the call is rare and some who immerse as often as possible. Some pass in mostly silence, some encourage, some offer greetings and tales of their story in these storied mountains but all are likely seeking to have the experience change them. Whether they want to relax from the hectic world, to forget a trouble or two left beyond the trailhead or perhaps to invite a change in their attitudes for a future they are only starting to plan in their minds. The mountains and wilderness have enough remoteness to escape, enough expansive view to humble our perspectives, enough stability to ground us, and enough altitude to unleash the belief in limitless possibility beyond. The trials of the trail help us immerse fully and when we emerge atop the ridges and peaks a change is often the reward indeed. So it was for me on Carrigain and on all of these summer 47 now behind me. Each time I’ve changed a little, grown a little, learned much of myself, my companions, and even of these wilderness wonders. I climb these mountains for myself, I share the story as part of a cause for which I believe there is much value in the sharing. I return to the reflections for me and hopefully refine them just enough for all of you that you may seek your own peaks, escapes, growth and inspirations on the journey of enhancing our lives ever forward on the paths we choose. Carrigain may have been the Watch Tower of the Wilderness to some and so too are we the Watch Tower Wardens in the Wilderness of our own lives. Tags: 2020VQ, blind hiker, challenges, Hike Leader, Hiking, Inspiration, outdoors, Quinn, Randy, success, Tripyramids. Earning Every Soggy Step upon the Tripyramids! The exceedingly water-logged trails of the Tripyramids gave a crystal clear reminder that success on the quest is not a foregone conclusion. I had perhaps fallen into the trap of being close enough to completion and sufficiently fortunate in success thus to have forgotten to some extent the very real potential of failure. Our final hike of last season was stymied by these very peaks; our Livermore Road loop over both of the impressive slides was called off to avoid the treacherous trail and significant risk of the north slide while it is wet. 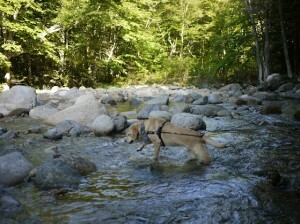 June was exceptionally rainy and the White Mountains are swollen with an abundance of water. Forecasts suggested all night rain would potentially leave us a morning of just clouds before afternoon thunderstorms might make the ridge line unwise. We decided to risk another retreat, but with wise counsel changed our route so that the slippery risks of the wet north slide would not be the deterrent. This meant likely longer and more challenging trail miles for our group. I suspect I was somewhat overconfident of our ability to handle the added difficulty this new route represented, as well as feeling a bit of the time pressure our quest requires for the August 24 deadline to finish all 48 peaks. Thus we began our ascent of Sabbaday falls with less than our usual trail study and reading of the trail reports which aid in preparation for the journey. The stream crossings always make more work for my blind footsteps and often not only slow the group as a result, but also make it necessary for me to utilize human guides earlier and more often than on the typical hike. So while we made generally good progress on the earliest part of the Sabbaday Falls trail, we found our pace greatly diminished by the first significant water crossings and the seemingly endless additional crossings caused by the transformation of every rivulet into a swollen stream. By the “Fool Killer Slide” we were well behind schedule and had to consider some questions of impending thunderstorms on the ridge. We then encountered the steepest section of the trail and most challenging scrambles, which increased these concerns and it took a team of support to help ensure we reached the col between our goals for a slightly late and hasty lunch. Dropping our packs eased all burdens and increased our pace as the gentler ridge line allowed for a quick out and back to the Middle Tripyramid peak. The cloud cover threatened ominously and we knew more haste was going to be required. 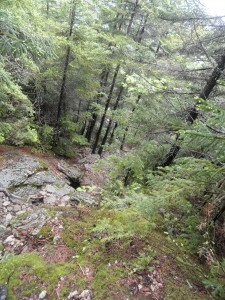 Instead of an out and back to return on Sabbaday, we realized we could shorten our mileage and perhaps find a gentler trail by crossing North peak and heading down the Pine Bend trail. It would add a mile road walk to the end but the impending storm effectively made the decision for us. We stepped up the pace across the half mile ridge to claim our 40th non-winter peak and then immediately ducked down the headwall of North peak. In moments, the booming thunder confirmed the wisdom of our choice to get off the ridge line but steep slippery scrambles made for a tremendously slow 0.8 mile in which human guides helped me with safety and speed but only by the the willing hard work of the team for which I’m very fortunate. Several cloudbursts soaked us thoroughly and an extended burst of hail pummelled our progress for a bit as well. The trail was gentler than Sabbaday but miles were slow and full of more water crossings and heavy mud as water logged boots and pruny feet were feeling the cost of the day’s journey. We were on trail for more than 11 hours with more than the normal allotment of bumps and bruises. Many mentioned the mantra of “earning every step” on this day’s travels. Never take your success for granted! The mountains can always present tough challenges. Thus it was that we emerged along the infamous Kancamangus Highway to find the mile “walk” had been run by Jennifer to ensure all car shuffling was easier on the bulk of the team. We passed on tailgate time and eased weary bodies into our vehicles for the journeys home. We did, however, take recollections of our shared experience and the team support which was the essence of this trip. 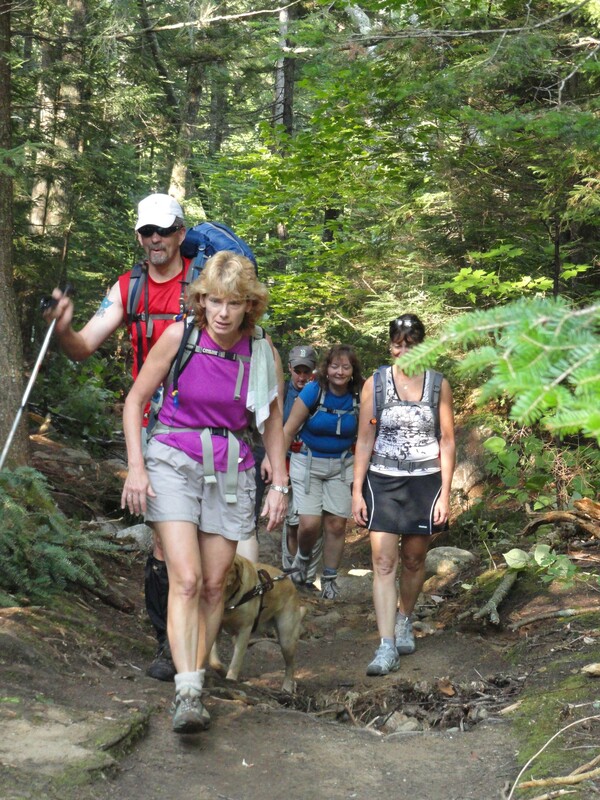 Some hikes are glorious moments of unparalleled views and feelings of personal conquest. The weather and work hid much of those moments from me on this hike. The teamwork and barely achieved perseverance became the difference between success and failure. 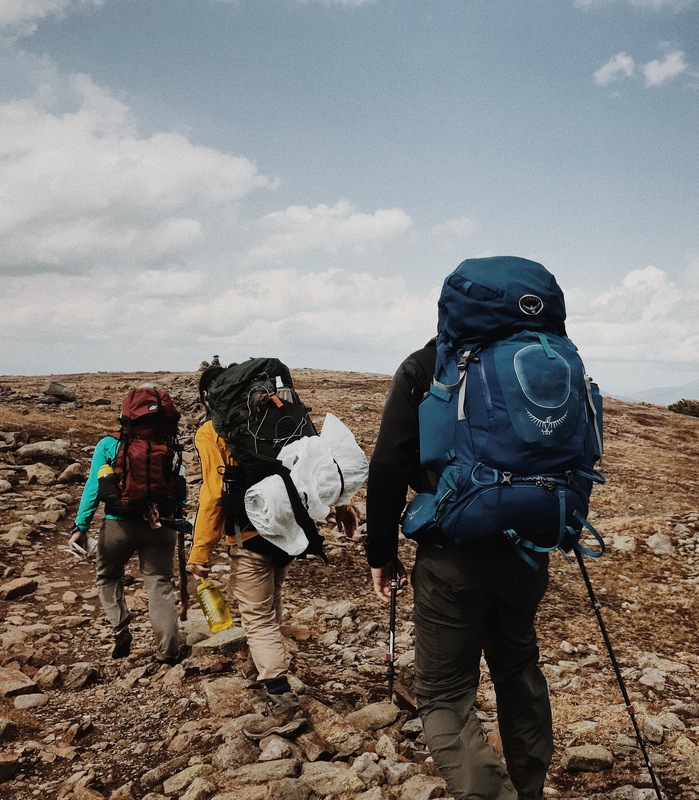 It was a hard-edged reminder that while we may set an expectation of achieving the quest and set an aggressive schedule to hopefully achieve success, the weather and mountains have much sway. We made all the right decisions and came together for a well earned reward but we won’t forget the goal ahead is by no means assured. Today I salute Drew, Robert, Jennifer, Aaron, Dana, Chris, Michael, Bren, Carl, Tracy and of course the Mighty Quinn. I salute also the respect due to mountains which provide so much variety of experience and lessons. Like most tales, this story only scratches the surface of immersing personally into the experience and I am grateful for my opportunity to do so. Quinn says, "So what's next??" 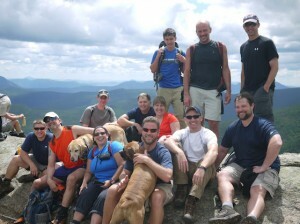 Tags: 2020VQ, blind hiker, Galehead, Hike Leader, Hiking, Quinn, Randy, success, Twins. Announcing that Tracy and I were “expecting Twins” created an interesting social media sendoff for our longest single day hike of the 2020 Vision Quest hiking project: North and South Twin, together with Galehead, all on July 21. The jovial approach belied significant respect for a section of trail expected to be our most difficult. My prior experience on that stretch supported this assessment of difficulty; in addition Backpacker Magazine gave special attention to that stretch when rating the region. 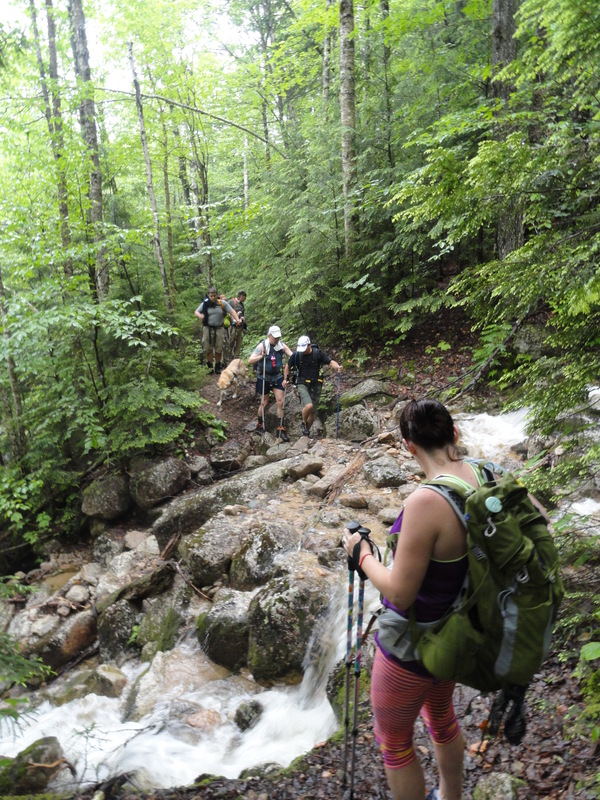 It deemed that hike the second most challenging day hike in the United States! That section descends from the summit of South Twin to the AMC Galehead hut in the col with Galehead Mountain. Drew and John were the hike leaders for the expedition with a mixed range of experiences in the diverse group of Randy, Tracy, Erik, Sharon, Tim, Mike, Chris, Aaron, Andy and yet another Chris. The Mighty Quinn shared warm greetings with Mike’s pup, Tahoe, and we were ready for the trip! The day started cool and we progressed on the trails at high speed for the first few miles until we encountered the first of a trio of respectable stream crossings. These were challenging points; different people in the group evaluated the best means for each of us to cross, though keeping the blind guy dry so early in a long hike was an additional consideration. It’s always wise to bring an extra pair of dry socks to use if necessary after the stream crossings–but unfortunately I had managed to leave my intended pair in the dryer! Several different people had route suggestions and were feeling pretty challenged at finding a particularly clear option. Many of my friends were willing to spend a lot of time helping to ensure my best comfort. Then there was Drew who took command and plodded through the shallowest section with me to save that most valuable resource of time… or was it my patience! Either way, it worked and there wasn’t much water impact, just jokes and laughter. True to the guidebook warnings, these crossings earned our respect and caution though neither Quinn or Tahoe seemed to have any trouble! After the final crossing, the fantastically smooth and easy trail vanished and was replaced by a steady uphill march for two miles. While nothing was unreasonably challenging, our pace was slowed and the temperature began to rise steadily. mass of the Presidential range and peaks into the northern Pemi Wilderness along the Twinway. You burn a lot of calories climbing steep sections, and a food recharge had been well earned. We were well ahead of schedule and while we were feeling the climb, spirits were nearly as high as the summit was close. Thus shortly after we had begun, four hours of labor had produced the first of the Twins and a happy crew atop the wooded summit. Starting the descent, we switched from Quinn’s work to Drew’s guidance to keep time steady on the downhill. The group was again making fantastic time and we worked our systems to keep the steady pace which quickly brought us the 1-mile jaunt to South Twin’s above-tree-line views in every direction. This time, the short break wasn’t so much for rest as it was to appreciate the splendor. Doctor Drew had delivered the second Twin and had a few words to share about the experience of being in such a remote setting! It was almost all downhill from there as the next 0.8 mile would drop 1,200 feet of elevation on the trail that had taken me three hours in my first journey there mere weeks before the founding of 2020 Vision Quest. It was perhaps aptly described as being less like a trail and more like one of the twins had spit up boulders the entire distance to the col! 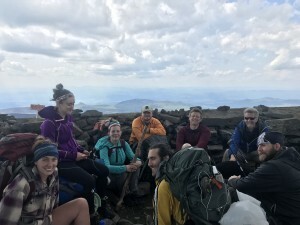 The plan was that all of the group who wanted to add Galehead to their list of summits would go ahead at their comfortable pace to the hut and take the Frost trail out and back. 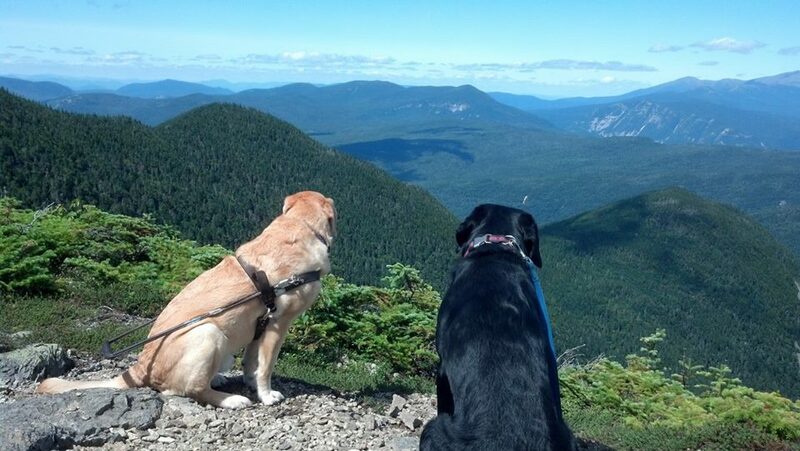 On that trail, they would experience the overlook into the backside of Lafayette and Owl’s Head on the way. 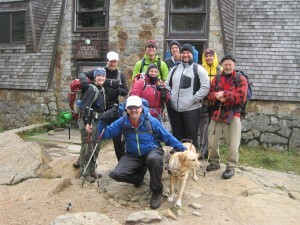 All would wait at the Galehead hut to rest, refill water, and bring the full group together. 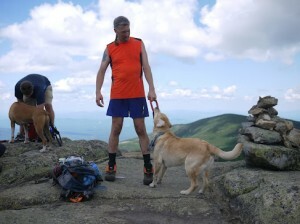 I had already achieved Galehead with UNH in 2011 and this would allow for my slower pace on the tricky journey. Sharon and Tim remained with me with Sharon’s first time guiding me on a hike taking place on that most challenging stretch. We were slow and steady with Tim helping select routes and Sharon talking me through the challenges while Quinn watched intently. It was slow going, but my pride and appreciation at the success and the improvement from the first summer trip there was immense. Timing was ideal as the last of the group arrived from Galehead in time to finish the rest stop, share a foot stretch and begin the final stage. The footing near the hut is particularly perilous to ankles and I had guide help from John to get me through the worst of it and to the top of the Gale River Trail. There CJ took over and we quickly developed a quality communication through steadily easing trail. By the time we had passed the new bypass trail we were cruising seamlessly and listening to the many conversations and bouts of laughter from our group which had come together so well. By the time the final mile of the long day had arrived, the traverse brought everyone to weariness–well, everyone not named Erik or Quinn! Quinn was in fact demanding his job back and ready to show that he could put some speed into the teamwork. We left the sweeper (that final person ensuring the rest of the team is ahead) behind and reunited with Andy and Aaron. The car spot team stole the drivers to retrieve vehicles while the overflow people relaxed and reflected upon the accomplishment. It was a long hard hike and as always the latter part always seemed like the limit of what we could do, but the smiles and memories were etched firmly upon each of us. 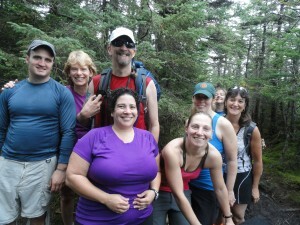 It’s unlikely this exact group will ever share a hike again but not for want or appreciation of the company. We always will have those moments and for some of us we’ll likely have them very intensely for a long time. It’s one of the many aspects of sharing an experience that cannot really be relayed properly in the retelling. Just as the images are never as vibrant and wondrous as the eyes report or the viewer shares while in the moment. Speaking of sharing, Andy had a few fantastic IPAs (Dogfish) to offer and teased us all by showing a cooler and grill ready to tailgate in the hiking style. Those of us without such foresight in the planning settled for holding on to the experience a little longer at the Common Man in Lincoln. Our numbers had dwindled but we kept the rest of our crew with us in spirit. 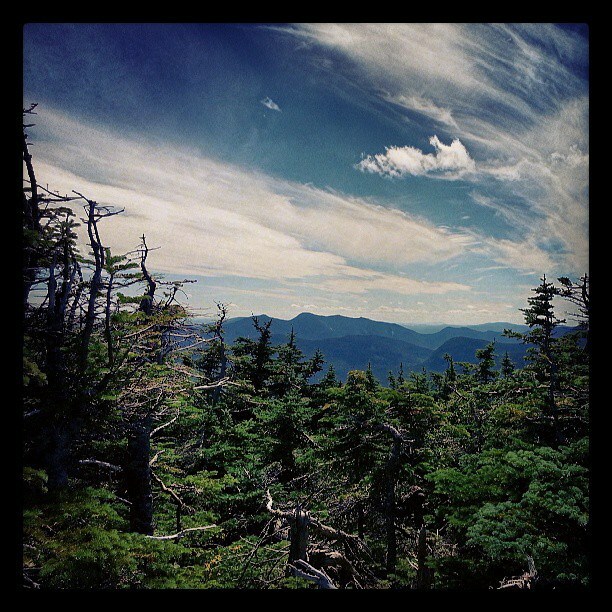 For me those spirits are with me even now as I reflect on peaks 27 and 28 for our 2020 Vision Quest! 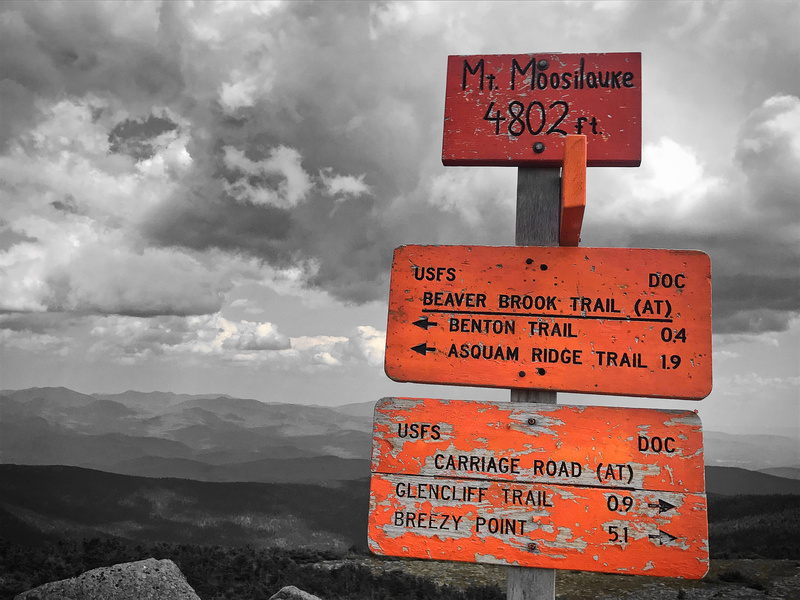 Tags: 2001, community, guest blogger, Hike Leader, Hiking, Inspiration, Moosilauke, September 11. The unimaginable happens. Then what? Ten years ago Sunday, a young Brooklyn firefighter named Chris Pickford lost his life when the Tower 2 fell. He was 32 years old. I’m a mother, and my heart recoils at the thought of losing my son in such a way. Yet it happened to so, so many people that day — we just can’t imagine all that pain, thousands of times over. Six years ago, Hurricane Katrina struck New Orleans. And barely two weeks ago, Hurricane Irene struck here. Like many readers of this blog, I indirectly know people who were lost to those disasters, not to mention homes and other beloved places. We hold the funerals. We mourn, we clean up, we rebuild, and the river of time moves implacably on. Later come the anniversaries and the memorials. To me, these hold a different meaning. Removed in time from the immediate impact, memorials call us not to recover, but to change. They ask us: how has this disaster changed you? And how does it change the world through you? 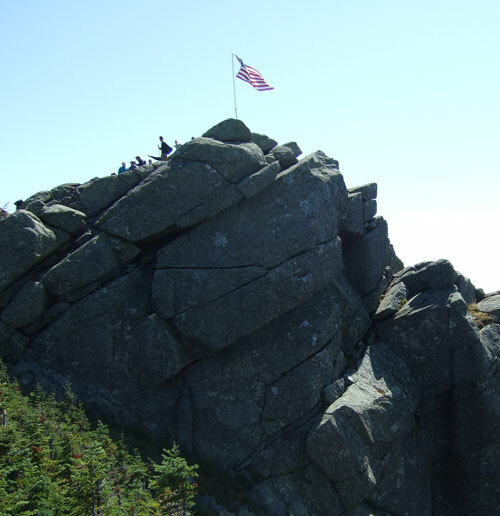 This Sunday, 2020 Vision Quest will take part in one of those memorials — the Flags on the 48 9/11 Memorial Hike. 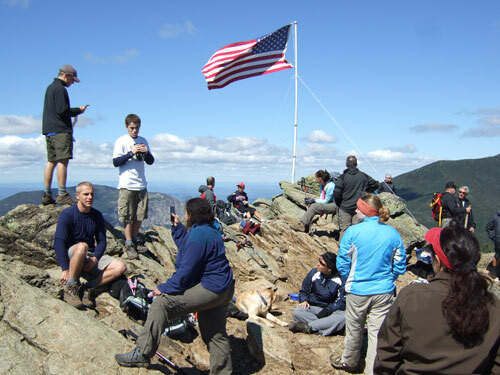 Of course, all of our hikes aspire to be part of something bigger than “just a hike” (we’re raising funds for two charities), but in this 9/11 hike, we’re taking part in a collective effort that really is far bigger than ourselves. Each of the 48 4000-foot peaks in New Hampshire will fly an American flag carried up by a hiking group. This carefully organized effort has been going on for nine years, occurring on or near the anniversary of 9/11. Chris Pickford’s family is entrusting to us the flag that draped his coffin ten years ago. We will carry that flag up Mt. 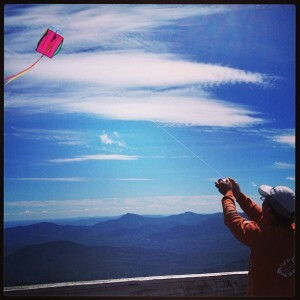 Moosilauke, and we will fly it from the summit from noon to 2:00. His cousin plans to hike with us, and we welcome him warmly. How has 9/11 changed you? How do you respond to the anniversary this year? For many people, simply remembering is response enough. There’s nothing wrong with that; sometimes it’s all we can manage, and remembering is important. Others respond by changing their lives entirely, such as by joining the armed services, or by working overseas to defeat poverty and illness and ignorance. God bless them all. For me, the Flags on the 48 is certainly one way I respond. I’ve hiked it almost every year, and it moves me deeply each time. I admit that I don’t have the courage to work on the front lines against military threats or global poverty. But another way I can respond is to raise a child who understands how different people may share this world in peace, and who knows the meaning of honor, sacrifice, and courage. Tags: challenges, Hike Leader, Inspiration, Motivation, safety. I first met Randy a little over 20 years ago, and in the last 7 years or so, we have become very good friends. Both of us were active in athletics as kids and adults, and this was immediate common ground for conversations. Later, we started going to Patriot games together and Randy has come to my school (I teach PE and Health) a couple of times to talk to my students. When Randy told me about starting up 2020 Vision Quest a few years back, I thought it was a great idea. He is always one to take on challenges, and this was a big one. 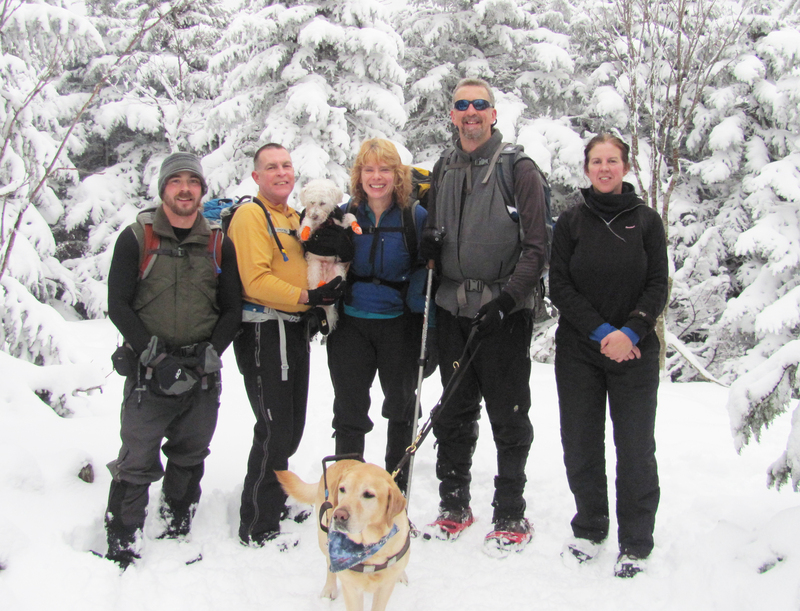 Randy’s enthusiasm was tangible from the beginning, and I very much wanted to be involved, so I signed up for the Mount Pierce hike last year. Team 2020 at the hut on Pierce last year. The author, Drew, is in the light gray coat. Not being a huge fan of camping, a day hike like this was perfect for me. I knew a few others in the group that day, and while it was a long hike, it was a great trip. It was my first time hiking in the Whites, and it was just a wonderful experience. 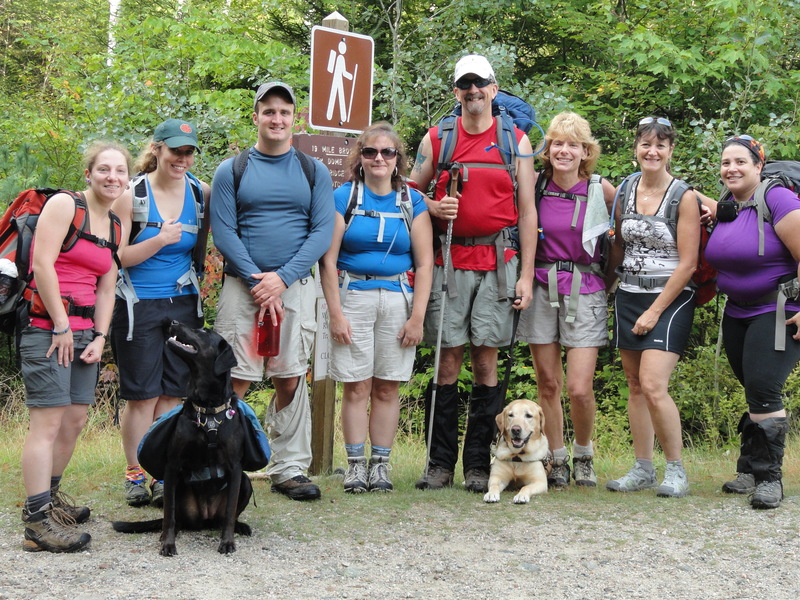 I looked forward to doing at least one hike every year with 2020 Vision Quest. Little did I know that Randy had bigger plans. This year, he asked me to lead to the Mount Waumbek hike. At first, I wasn’t sure that I was the right person. After all, my first (and only) hike in the Whites was the previous year. Randy can be persuasive, however. He pointed out that I help lead 50+ students up Mount Monadnock in Jaffery, NH each year. Of course, this was also going to be a one-day event as well, making prep a little simpler. 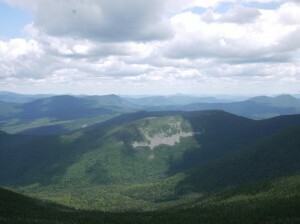 Finally, Mount Waumbek is one of the smallest 4,000-foot peaks at 4,006 feet, making the hike an “easier” climb. How could I not say yes? 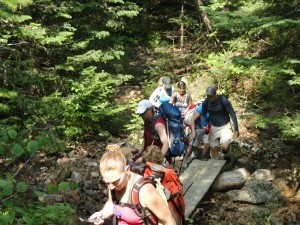 There really is no such thing as an “easier” or “simpler” hike. 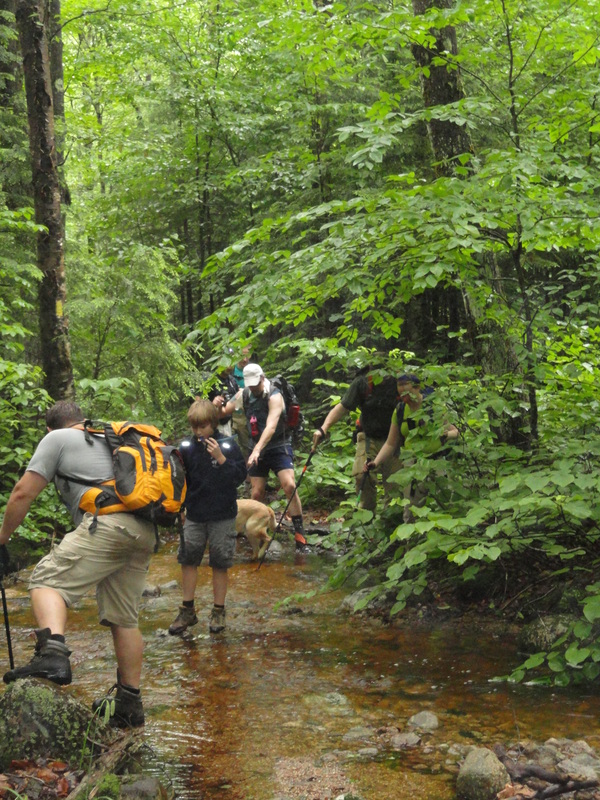 Each trip into the mountains and woods has unique difficulties and areas for concern. In leading, I am taking on the responsibility of not only myself, but also the whole group of 10 (11 with the Mighty Quinn). This time I will only know Randy, Tracy, and Quinn. 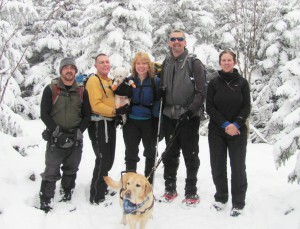 However, Chris Garby, an experienced hiker, is co-leading the hike with me. I’m sure his knowledge and experience will be very useful during the trip. The rest of the group is not strangers so much as friends I just haven’t met yet. 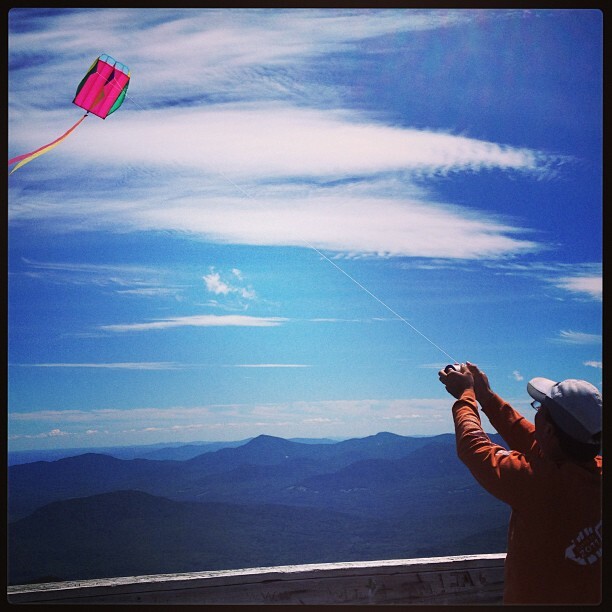 In addition, sharing a beautiful trip into the Whites is a great way to get to know others. If I have learned anything from Randy over the course of our friendship, it is that all challenges, big and small, should be met with a positive attitude and a willing work ethic. No matter what the challenge is, taking it on leads to a better sense of self and stronger relationships with those involved. Of course, if this hike is a great time as well, I’m sure Randy will try to convince me to do an overnight hike next year. Tags: blind hiker, Hike Leader, Inspiration, success, Support, Team 2020. There are many reasons this was the most daunting hike to date. The weather forecast did not help much, as thunderstorm potential was present every day of our trip. 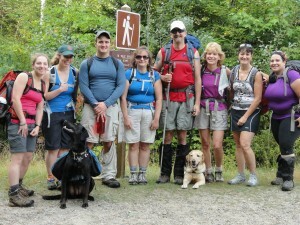 Our group hit the trailhead at 7:00am on Saturday with good weather and appropriate anxiety. A sense of urgency kept words and packing efficient as we began the 3.8-mile ascent up Valley Way. Quinn sensed the apprehension as his work was cautious but quick through the easier early miles. As the terrain steepened with a few trickier points, Rob Carroll shouldered the challenge of guiding me, while Cliff Dike took on Quinn care. We became quickly efficient at communicating and our speed was solid as is evident by our reaching the hut by 12:30pm. 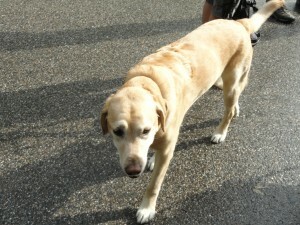 The immediate excitement was the approach of a medical helicopter. 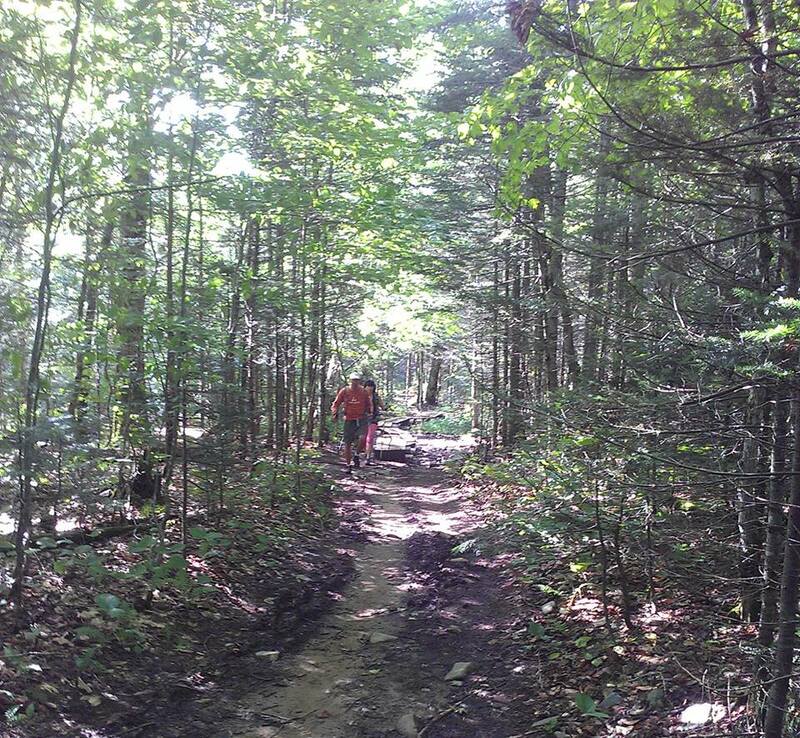 An ankle injury had forced a hiker to spend four days at the hut awaiting weather good enough to land a helicopter and evacuate her from the challenging trails. This was an ominous reality check despite our successful work thus far. We enjoyed lunch at the beautifully renovated hut while debating the timing of going for Adams during this better weather. Uncertain of how well we would manage the terrain of either summit, we opted for the practice of the shorter Mt. Madison. The decision was rewarding as Kyle led me along the most challenging footing I have yet traversed in these mountains. Our significant work together in the past paid dividends as well. We made the summit in well under an hour and clear skies with no wind gave us the opportunity to appreciate the beauty that surrounded us. It is simply awe-inspiring to experience the full majesty of the heart of this 300 million year old mountain range unfurled from atop the northeast corner of the Presidential peaks. Slower but steady and satisfying work led us back down to the AMC Madison Springs Hut. 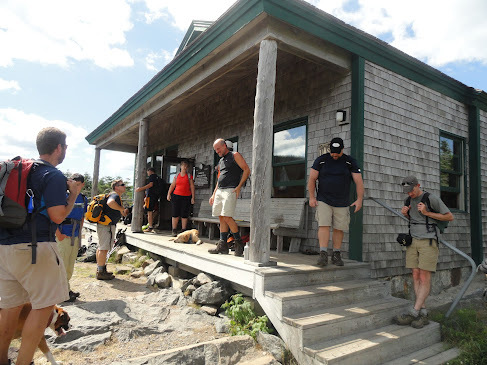 We fully appreciated the many renovation upgrades and a turkey dinner, which was an incredible repast for this group of hungry hikers. The ‘buzz’ of many enthusiastic members of our team and the full entourage of travelers was an excellent energy burst. Some enjoyed a naturalist presentation while Kyle’s advance scouting of the Gulf Side Trail unearthed a different bit of nature. 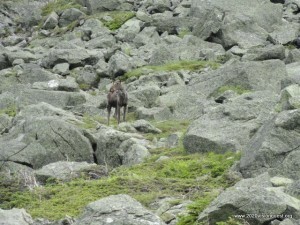 A young, but large moose had wandered above tree line and watched us from the shoulder of John Quincy Adams. We shared Kyle’s find with many and all delighted in the rare experience before settling onto a bench to once again savor a spectacular sunset. Day one was in the books with complete success and thoughts were turning to the deteriorating weather reports and tomorrow’s monumental goal. Packs were loaded before breakfast and we were quickly upon the trail to seek the peak before the weather arrived. It was a very pleasant morning and Quinn was called upon initially. The terrain was challenging for our work together, and due to the time pressure, we attempted human guidance once again. John Corbett’s tall frame and long strides would match my own well and so he joined the ranks of those guiding me. Our speed increased as we worked together along the edge of the beautiful King’s Ravine. It was more than an hour to traverse the Gulf Side Trail but we hit Thunderstorm Junction earlier than the storms and still felt strong in body and mind. A storm was definitely coming but there was some time, so Kara Minotti Becker, our leader, took over as my guide while Ben Becker took an additional role to scout the route for her as we ascended the summit cone of Mt. Adams. Whether it was our focus, the anticipation, or the success of this double team, the terrain seemed less challenging than Madison to me. The crevices were deeper, the stones sharper and more erratic, yet our route led us smoothly to the summit just as the wind began to rise higher. Even as the celebratory summit picture was taken, two probing cloud hands reached over Mt. Washington and hurled the dense storm clouds over the summit and towards us. We ratcheted up the urgency significantly and began a hasty descent! Moments later, we realized the terrain would be considerably more difficult going down, and Kyle took over guiding with Ben’s continued scouting. As the first drops began, pack covers and rain gear was donned just in time to withstand the worst of the sleet, which began to pelt our trail and us. Our progress was necessarily slower than we would have preferred, but still quick for the pre-trip expectations. It had turned to rain by the time we rounded the exposed western edges of the ravine and we were managing the slippery wet rocks very well. We finally found the comfort of the hut, and a long afternoon and evening allowed the group camaraderie to grow stronger as we celebrated our successful experiences. 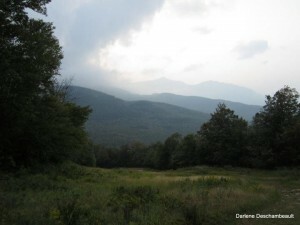 We read books from the hut supply, played games, and partook of the educational presentation on Geology of the Presidentials, while heavy rain and dark clouds encased the hut. It was a long but gratifying evening in which our “Adams Family” hungered for more hiking together. Monday, July 4, brought us beautiful weather for our descent down Valley Way, which would signify the full success of our trip. Feeling the confidence of our prior work, we allowed time to dry much gear in the warm sun as we shared stories and jests atop the col. Finally, at 9:30am we reluctantly released our hold upon the hut. Kara worked the more difficult and steep section, to practice the different challenges that going down presents for me. After a couple of hours of the slower terrain, Ben replaced her for his first work guiding me, though he had watched and learned much previously. With the somewhat easier trail frequently dotted with the grooved slots, which challenge Quinn and I together, Ben made a long two hours of work, up to the easier final stretch where Quinn eagerly took back his job, and raced out with me in tow. Our expedition was at an end, and yet another team had become a key part of my life and the experience of our quest. These mountains deserve all the daunting words and emotions they held in advance of this trip. This group deserves all the accolades for undertaking the challenge, building our bonds, and savoring an exquisite experience. I may not ever be so fortunate as to assemble this team again but I will always treasure this journey and hope for the possibility for an “Adams Family Reunion” on whatever adventure might await! Tags: 2020VQ, Hike Leader, Hiking, Motivation, Support, Team 2020. In sports, there is much talk and concern over the dreaded letdown game. For those not familiar with the term, a letdown game is one where a team comes off an emotional, meaningful victory and turns in an uninspired, lackluster performance in their following game. Another contributing factor to a letdown performance is when a team looks past their present opponent to a more daunting, challenging foe looming in the near horizon. Whether you believe in this letdown concept or not, acknowledging its possibility allows us to see how Team 2020 may be perfectly positioned for a letdown performance. As the interim coach, or hike leader, of Team 2020 on our upcoming game against Mt. Whiteface and Mt. Passaconaway of the White Mountain Sandwich Range conference, I must warn my team against a letdown performance. Team 2020 is on a roll. With recent success against perennial powerhouses Owl’s Head, Mt. Garfield, and Mt. 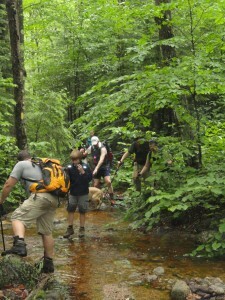 Lafayette, the Vision Quest squad is off to a roaring start for the 2011 hiking season. Randy and Quinn’s successful return to the Pemi is proof of the vast improvements they have made since this time last year. With new experiences and new hiking companions, the team continues to learn, reflect, and grow stronger. As Vision Quest’s confidence and excitement grows, we inevitably begin to look ahead to what many are calling the game of the year, the clash of the titans, as team 2020 takes on #2 ranked Mt. Adams and #5 ranked Mt. Madison on July 4th weekend. So there you have our current situation, sandwiched between a successful trip to the Pemi and a looming battle with the Northern Presidentials. Do you think Team 2020 may be in danger of that letdown performance? I don’t. With Randy wearing the captain’s armband and Quinn and Tracy sharing the assistant captain duties, I have full confidence that Team 2020 will be physically and mentally prepared for Whiteface and Passaconaway. I have faith in Randy’s attitude and leadership, Tracy’s unwavering support, and Quinn’s tail wagging, that our leaders will get our team motivated and ready to go. 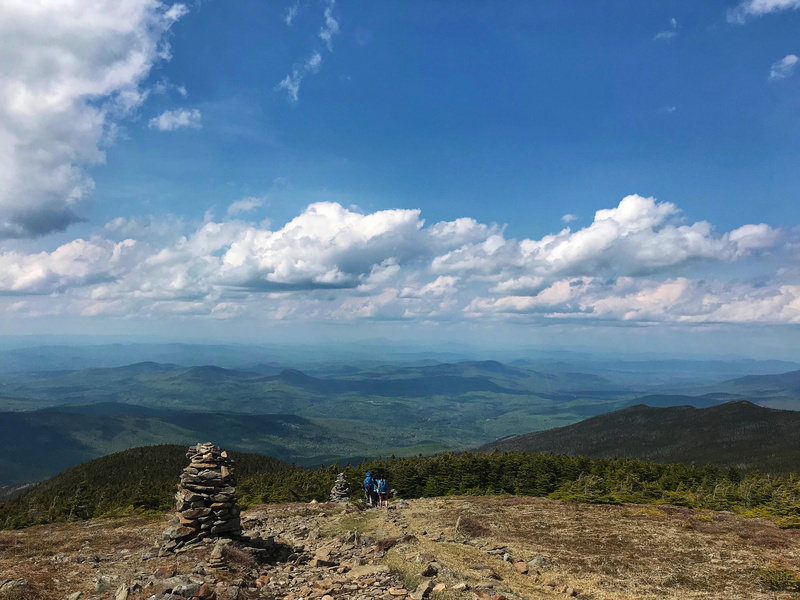 I have been told by one rather knowledgeable and experienced friend that Whiteface and Passaconaway pose some of the most challenging, viewless hiking of all the 48. I’ve read trip reports that claim that the rock scrambling on the Whiteface ledges can be quite intimidating and dangerous. With 12 miles of hiking and significant elevation gain over two days, we have a stiff challenge in front of us, but I look forward to the hard work, learning experiences, and most importantly, time spent in the woods with good friends. For those who still have doubts of a letdown game, I leave you with a brief tale of Passaconaway – more of which I’ll share to the team in the locker room before the game. 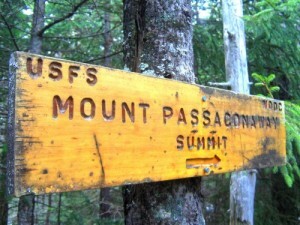 Passaconaway is named for the legendary chief of the Pennacook tribe. Passaconaway was revered as a great Indian chief, medicine man, and peacemaker to both the natives and white settlers. There are two unique tales about Passaconaway’s death which I learned from reading a short excerpt from Charles Beals’ Passaconaway in the White Mountains. 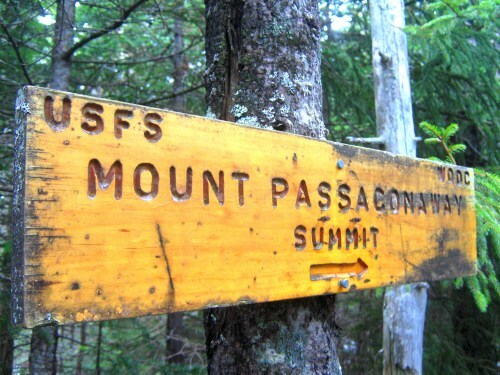 The first story claims that Passaconaway was buried in a cave on Mount Agamenticus in present day York, ME, a significant mountain in Randy and Quinn’s hiking history. The second tale is as follows. The native’s feared the mountains and seldom, if ever, visited the summits. The most feared was Mt. Agiocochook (Mt. Washington) where the natives believed The Great Spirit resided. I leave you with the tale.